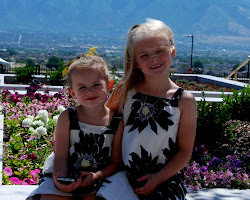 Do you ever stop to think about the little things that make your kids happy? Jade, very often surprises me by the ways she finds entertainment. We were spending the evening at my parent's house. 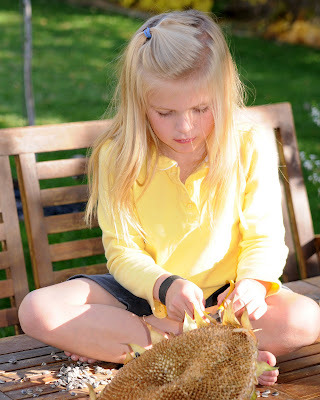 Dad had left a great big sunflower head on the table outside. While everyone else was busy inside, Jade disappeared. 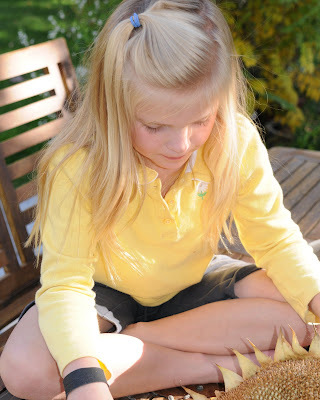 We found her sitting quietly on the table, plucking seeds out of the sunflower so that she could feed the birds. She worked very hard on it and was being very serious. 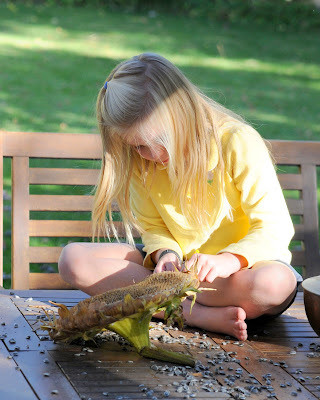 A couple of days later we were back at my folk's house and the first thing she did was run out to the table to see how the birds had feasted on her offering. She was thrilled to find many of the seeds were gone. I was really glad that mom and dad left her mess so that she could enjoy it days later. What are some of the funny things your kids do for entertainment? That is precious! I love those simple moments.